If you consider adopting a turtle, don’t be misled with a common preconception that turtles need only a few leaves and a fraction of plain surface to crawl on. For both aquatic and land turtles you would need to set up an equally comfortable habitat and learn to feed them properly – but don’t be frustrated! In this guide on how to take care of a turtle, we’ll give you all the basics to get started. 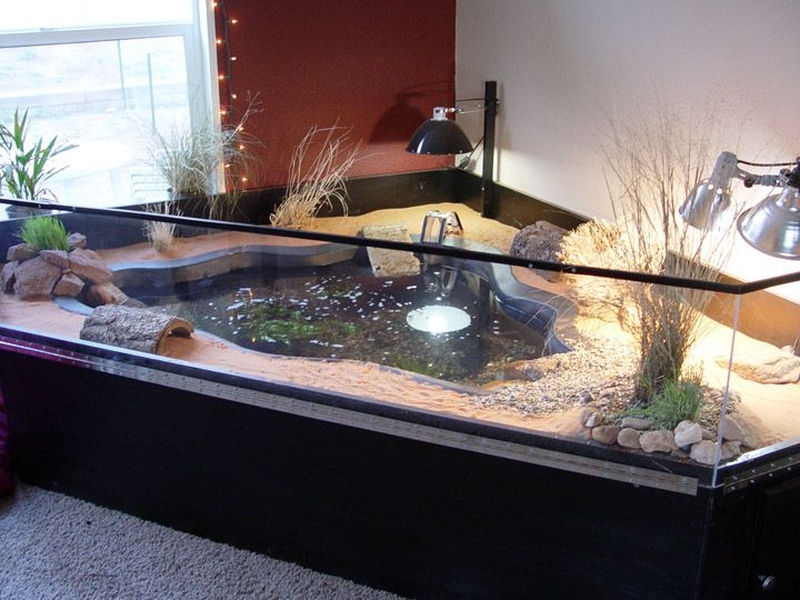 First, make sure you choose just the right tank for your breed, as an aquarium for an aquatic turtle is different from a land one and has a bigger water pool, to start with. Consider the dimensions of your turtle when grown up and choose appropriately – on average, the aquarium volume should be between 40 and 60 gallons. In any case, it should allow for setting up a semi-aquatic environment with a necessary space for both hiding and light basking. This is an easy part, and probably the only one where you won’t need to consult a specialist to figure out how to take care of a turtle. When filling your aquarium with substrate, lay a few inches of sand on the bottom and don’t forget to sculpt a slope for your turtle to get out of the water conveniently. If you have a land turtle that needs only a pan of water, make sure the substrate layer is deep enough to accommodate the submerged pan. The only important thing to know about water is that it shouldn’t be chlorinated. Pour an optimum amount into the aquarium and then fix a special filter to keep the water clean at all times (still, it doesn’t mean you shouldn’t change water once a week). Each turtle breed would require its own temperature standards. When consulting on this matter, ask for the right temperature ranges for a cooling place, a basking spot, water and nighttime. To keep up with these recommendations, you would need a few thermometers at various places, as well as portable heaters (usually, in the form of a bulb) designed especially for these purposes. Although turtles are pretty peaceful creatures, they are known to be omnivorous, which means they can devour everything in their sight when hungry. To avoid this, either place only one turtle in a single tank or make sure your little pet is well fed all the time. When in doubt, consult a herpetologist or avoid a dangerous co-inhibiting altogether. One of the major parts of your knowledge on how to take care of a turtle is to learn the right feeding techniques and dietary habits. One of the most important rules is that aquatic turtles always eat when in the water, so you should provide food accordingly. Even if you feed it from your hand or out of the aquarium, it will need water to swallow the food. Another common rule is to keep it less messy as much as possible and try to feed it in a separate tank from the aquarium. For solid food, however, a single tank for living and feeding will do, but for liquids and purees it’s recommended to use a separate area for easier cleaning. It’s known that turtles can eat nearly everything, but a healthy diet is essential to their wellbeing. Buying special treats in a zoo store is the key; always opt for some well-known brands of turtle food. In other cases, treating them with small chunks of fish, vegetables and green leaves is also acceptable in moderate amounts. If you’re a newbie and want to know how to take care of a turtle by sticking to a proper diet, you can also opt for vitamin and mineral supplements, but usually commercially available turtle food will contain everything needed. Calcium is an exception, but you can easily add it with special supplements or placing calcium-rich elements in the tank. The same is about vitamin A, but its deficiency leads to a clinical disorder and should usually be treated professionally by a veterinarian. Don’t be misguided by your turtle’s begging for food – these creatures are known for eating everything on offer even when they are not hungry. Stick to a proper and healthy schedule – young turtles should be fed every day, and for older ones feeding once in two or three days is common, providing that you treat them with some green leaves in between. If you opt for giving smaller amounts, feed your turtle less but more frequently – up to 3-4 times a day. Still, the most important rule is not to overfeed them as this may result in digestion disorders and all sorts of medical problems. Again, professional consultancy always helps, so that you can tailor the feeding patterns exactly to your turtle breed. Make it your good practice to clean the tank every 2 weeks. This includes pouring out all the water, washing the tank walls with a sponge and soap, rubbing the walls thoroughly to get rid of all the stains, disinfecting the surfaces and changing the substrate. Another way is to buy a special water filter that will keep it clean for much longer. Still, even in this case it is recommended to clean the tank once every 2 or 3 months. When it comes to the swimming water, you should ensure it’s clean at all times by putting a filter in it or changing it every 2 or 3 days. For drinking water, it’s an absolute must to change it every single day. Your awareness of how to take care of a turtle won’t be complete without knowing how to deal with the products of their bodily functions. First, get rid of all the food leftovers left in the tank to avoid foul smells, rotting and bacteria. To cope with feces, remove the pellets daily with some handy tools and clean all the soiled spots carefully. After that, don’t forget to clean your hands – it’s not just turtle hygiene that matters. Server responsed at: 04/18/2019 10:21 a.m.